Pork chops—bone in or boneless—are so delicious and easy to cook. But that also means they are easy to overcook. And there’s nothing worse than a dry pork chop that is too tough to swallow. Enter sous vide. It’s a cooking style that is known for its ability to keep cuts of meat, such as pork chops, moist and tender. It’s also a failsafe way to cook pork and guarantee it’s going to turn out spectacular. Every single time. Promise. How does this work, exactly? 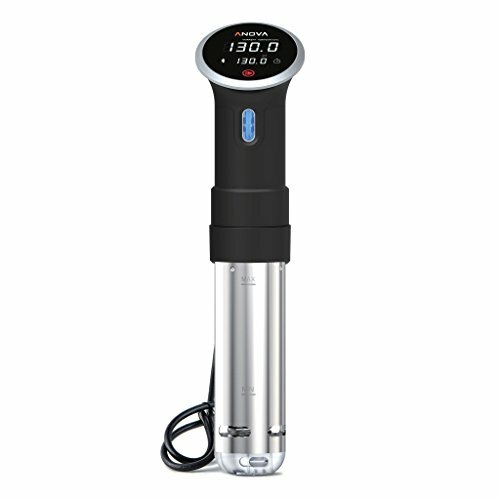 Well, sous vide cooking uses an immersion circulator to create a consistent temperature environment for cooking, and therefore, consistent cooking results. It basically acts like a slow, gentle poach, one that helps food retain its moisture, too. The low, slow method of cooking sous vide is well suited to proteins, like pork chops and steak. It makes for an incredibly tender cut that remains juicy and flavorful with no question of doneness. There’s a little bit of a learning curve with using this style of cooking, but it’s nothing to be too wary of. It’s mostly a hands-off process, not unlike cooking in a slow cooker. Bone-in pork chops take about 1 hour to 1 hour 15 minutes, depending on how thick they are. The first time I made this recipe, I cooked four chops that were about 3/4 inches thick and weighed about 1 1/2 pounds total. They took about an hour sous vide, and then I seared them on the grill (a few minutes on each side) to develop an outer crust. The ones I used in the photos here were larger—a little over an inch thick and about 2 1/2 pounds total. Because of their size, I cooked them a little longer, for an hour and 10 minutes. I checked them with a thermometer and they weren’t quite done, but they quickly finished cooking on the grill. If you are cooking boneless pork chops, about a pound of boneless pork chops should take about an hour at the same temperature (140°F), but much less time when you finish them on the grill or stovetop—2 to 3 minutes each side, if that. 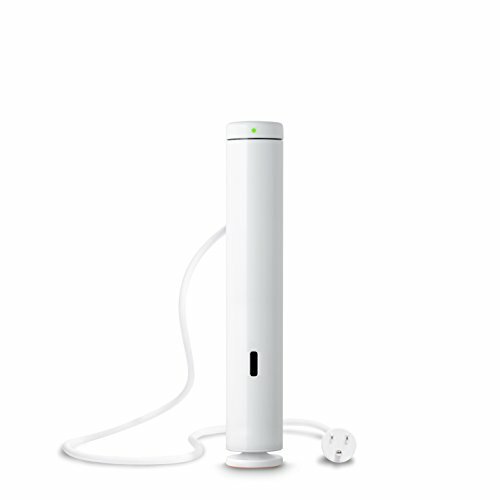 The beauty of cooking sous vide is that you can cook food from frozen, without thawing, and it’s perfectly safe—just add an extra 30 minutes to the cooking time. With this recipe, package the raw pork chops in plastic bags just as if you were about to sous vide them, but then place them in the freezer and store for up to three months. The other option? You can cook the whole thing ahead of time, refrigerate for 3 to 4 days, and then pull the pork chops out and either grill or pan-sear just to get some color and warm them back up. MAKE THIS RECIPE YOUR OWN WITH SEASONINGS! This recipe is deliberately basic—this way you can really taste the flavor of the meat, which becomes incredibly tender and moist when cooked sous vide. When you’re learning a new cooking method, I’m an advocate of keeping it simple in order to really learn how it works—and how the method impacts the ingredient at hand. You don’t need to do very much to make a pork chop tender when cooking it this way; it preserves so much moisture. You might not need, for example, to overload it with sauces or other elaborate rubs—all you’re doing is giving it a slow poach, and the simplicity of that approach will enable you to taste the meat. But once you’ve mastered the basic technique, feel free to use your favorite herbs and spices for pork, or experiment with sauces and marinades. I’m honestly so wowed by the simplicity of the pork chops with herbs that I’m going to be stuck on this combo for a while. Proteins cooked sous vide don’t brown nicely or look “cooked” in a traditional sense, the way a pan-seared chicken breast or grilled steak will. Sometimes sous vide food looks grey or beige when you first pull it out of the bag, which isn’t very appealing. After all, we eat with our eyes first, right? For this reason, it’s often recommended to finish meats cooked sous vide either on the grill or on the stovetop. This sears the outside and is also another opportunity to impart a little more flavor. In the case of these pork chops, we finish them off on the grill, thereby granting them the best of sous vide (exceedingly moist and tender meat) and the grill (nice char and flavor from the direct heat). Boneless chops can be subbed for the bone-in chops. Cooking time will be 1 hour. 1 Heat the water: Fill a pot with water and place your immersion circulator inside. Set the temperature to 140°F and let the water come up to temperature. 2 Prep the pork chops: Add the pork chops to a gallon-sized zip-top freezer bag along with the salt, pepper, chopped herbs, and olive oil. Toss together in the bag to distribute the ingredients. It's fine if the chops are in a single layer or overlap; they will cook at the same rate either way. You can do this in the pot of water as it heats (just be careful if the water is already steaming!). 4 Cook the pork sous vide: Once the water has come to temperature, submerge the sealed bag of pork chops. Make sure the bag is completely submerged, otherwise the pork will not cook evenly. Cook for 1 hour if the chops are bone-in and under an inch thick, or if you're cooking boneless pork chops. Cook for about 1 hour and 10 minutes if you're cooking bone-in chops that are thicker than 1 inch. When cooking time ends, remove from the water, and turn off the circulator. 5 To finish on the grill: Heat the grill to medium heat and place the pork chops directly on the grates. Depending on thickness, grill for a few minutes per side, until the outside is seared and develops a golden crust. To finish on the stovetop, heat a sauté pan or cast iron skillet over medium-high heat and add a little bit of olive oil or butter—a tablespoon or two should do it. Add the chops to the pan and sear until the bottom develops a golden crust, one to two minutes. Flip and repeat on the other side. 6 Rest and serve: Rest the chops for about 5 minutes, the serve sprinkled with some sea salt and additional fresh chopped herbs over the top, if desired. You can also drizzle the juices from the cooking process, additional olive oil, or your own favorite sauce, such as gremolata or pesto. Hello! All photos and content are copyright protected. Please do not use our photos without prior written permission. If you wish to republish this recipe, please rewrite the recipe in your own unique words and link back to How to Cook Pork Chops Sous Vide on Simply Recipes. Thank you! I am definitely going to do this! I find pork chops to be one of the hardest foods to do well. I use my Instant Pot Ultra for sous vide cooking – it is not QUITE as perfect as a “real” sous vide but it gets the job done!